Is it about Time? The Media always tells everyone that Market Timing can’t be done. But isn’t it one of the essentials of Investing? Don’t we all do it? Don’t they all talk about it all day long on the T.V.? It is only Human. We almost can’t “not do” it. Unfortunately we Believe in our Rational ability to do it. Humans are prodigious Error makers and so are, Markets. The esoteric inference of Behavioral Finance is that Market Timing requires Non-Rational tools. Investors Think about and Believe the most available Rational Stories that are available to them. However, the Rational Mind cannot “Understand” Market Behavior. It “Rationalizes” the Market but only, in Hindsight. We may need to study “How,” but not necessarily “Why” Markets behave, to keep tabs on Mr. Market. Don’t ignore Errors. Do not Ignore Ignorance! I use the Non Rational tools of Dorsey Market Sentiment and Dorsey Trend Duration analysis to diagnose how markets are behaving. My Trend Timing studies focus on Highs and Lows but there is another way of studying Time Patterns that is not about anticipating an absolute end point in terms of Price. Market extremes are by definition, very rare. Thus, they are very low probability events and are almost impossible to predict. However, once Extremes do occur, they be- come price facts which we can trade against. Once we recognize that we really don’t know what is going on (along with the majority), we may wait until the majority makes a mistake. We can then profit from their Errors. Once we realize that inherent ignorance of markets, it also becomes possible to identify when NOT to trade. Time can then become our ally. Is the Market Running out of Time or, Running into Time? Big Market Calls are often untimely and unrewarding. Don’t think too hard about the Market. Respect the Unknown. Everyone wants to Know what is Unknowable. Now, what kind of a Trade is that? Let the Market run its race. Wait for Errors. Time Patterns offer some relief from obsessing about a High. 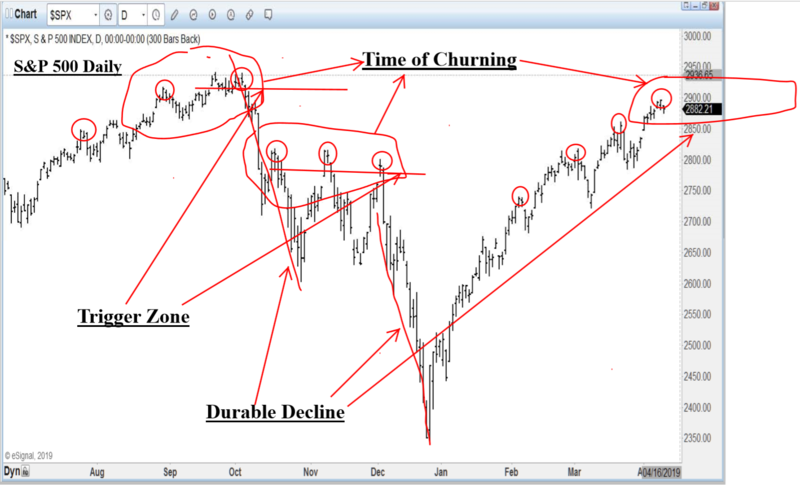 Let’s look at the S&P for some instructive Patterns. What Time Works for You? When is the best time to be Short? Look at the S&P 500 in the last year. Now, Pick a Top. Any Top. There were many. Which one would you pick, in hindsight, to establish a short position? A “Top” actually becomes important by the Degree of the Decline it initiates. The best Declines are preceded by a “Time of Churning.” Once a Market Decline is triggered traders, “Recognize” it as a Market Error. As we see, some Tops are better than others. This essay is about looking for a Time of Churning to identify a Trigger Zone when an Error is recognized and initiates a Durable Decline. Information is for paid subscribers & may not be copied or distributed. © Copyright 2019. The information contained herein was provided by Sentiment Timing and/or its publishers does not make any representation or warrant with regard hereto, including but not limited to those of accuracy, completeness, reliability, timeliness and/or infringement on the rights of third parties. This Publication expresses a view on the markets but is not intended to provide any specific recommendation to buy or sell any security. Investing is Uncertain and always carries Risk. Of Losses. Subscribers should always assess Market Risk parameters with their broker or financial adviser. Get the trading advantage you’ve been looking for with The Master of Investor Sentiment, Market Timing Expert, Woody Dorsey.